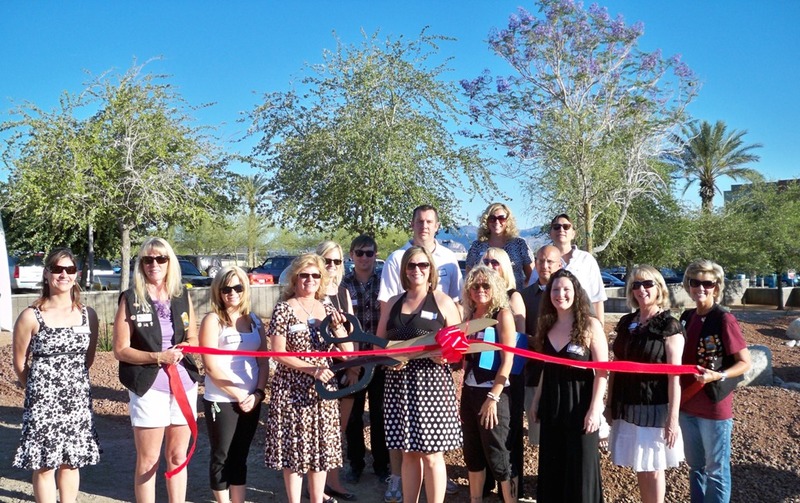 The Lake Havasu Chamber of Commerce Leadership Development class of 2011 unveiled the Heart of Havasu Park after a ribbon cutting by the Chamber Ambassadors. Thirteen leadership class members worked on the park, replacing 21,000 square feet of sod and replacing it with xeriscape, which is the use of native rocks and plants to conserve water. On hand for the park ribbon cutting were: Front row, Kris Horton, Audrey Hoyt, Kara Martinez, Lisa Rose Theophilus, Colleen McShea, Pam Reinke, Bobbie-Ann Morrison, Debbie Crossland and Denise Johnk, middle row, Amanda Jensen, Pam Bernhart, and Brock Spillane, back row, Bryan Goodwin, Scott Becker, Michele Anderson and Cat Wolff-White. For more information on Heart Park or the Leadership class contact the Chamber of Commerce at 855-4115.